I can't wait until I get my hands on the new Sifteo Gen 2.0. Actually, I did get my hands on them already but only for a brief evening at a special BlogHer event about a month before the official news was released. 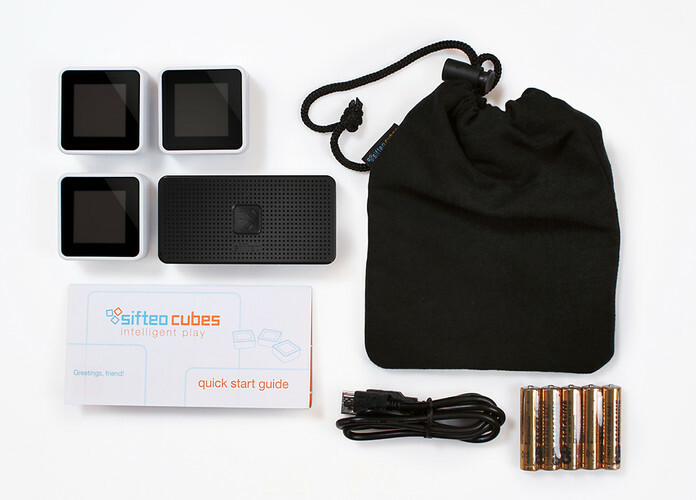 The original Sifteos needed to be near your computer in order to hear the audio and to change the games but now with a new Sifteo base you're able to move about anywhere with your cubes. The computer is necessary only to download new games. To select from different games can be done with a touch of just one button on the Sifteo base! OH, and hello? 'Tis easier on thy wallet! Yeah! The new lower price is now $129.95. It comes with three cubes and the Sifteo base. Three cubes had been enough for me but I know my kids will be thrilled to hear that up to 12 cubes can be used with the new software. Each additional cube will be $29.95. 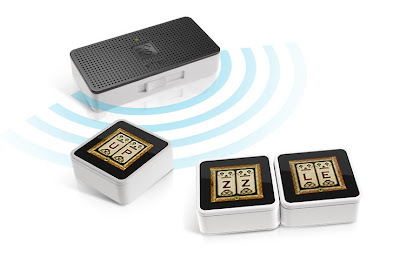 The old Sifteo games and cubes can not be used with the new ones however the new cubes do come with four pre-installed games. Additionally new partnerships have been created with Sifteo, including one with Nickolodeon, to bring new games to the cubes. I know of at least one other fantastic logic game in the pipeline (can't say who but Toys are Tools readers would be THRILLED) that is in the works. But don't even try asking me... I won't even tell my husband. Without going into a full review yet, here are two points that need to be explored. 1- These are good for folks who like to work with their hands. This doesn't mean you have to have amazing fine motor skills. Hands and fingers are different. I love working with my hands. Even when playing the Simon Flash, my favorite game involved shuffling and not the original game where you are solely pushing buttons which I found to cause me a little stress. 2- There is a "beyond-comparison" factor that should be explored. Being able to move things around and grab them all in your hands is something worth studying but not as in seeing how they hold up yo other games but rather, we should think about the new possibilities of what can be done with the cubes. They really are very different. And that is what "new" should really be all about, right? Not about who's better but really about what can now be done with these new portals of fun and learning. The new Sifteos are available for pre-order on www.sifteo.com and on Amazon and Toys R Us. Enthusiasts new and old can expect to enjoy them in November. Watch an early TED video about Sifteos here. You'll understand what I mean by "different." It really inspires imagination. Disclosure: Toys are Tools has not been compensated by any company to release this information. The previous version of Sifteo had been sent Toys are Tools to facilitate review purposes and understanding of the new and older Sifteo models. Now that looks like a fun video game! This looks so cool! I am a little worried about the durability, but it looks like a great idea! It is really intriguing but I agree it is kind of expensive and I'm not sure it would keep their interest for long enough to justify. I always wish there was a toy lending library so we could try things out and pass them on! I bet my Son would REALLY be into this. This looks quite amazing really, but I also think it might be something that he would play with for a while then put aside. Not sure. Would love to see one in action.